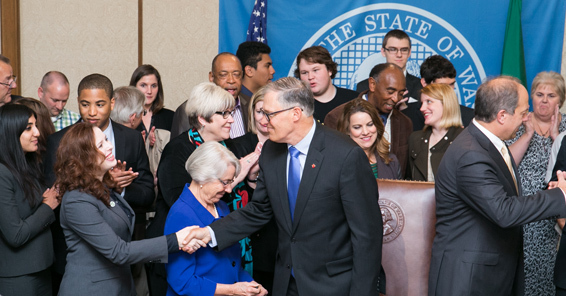 On May 14, 2015, Washington Governor Jay Inslee signed into law a major change to the way the legal system treats former juvenile offenders. SB 5564 will abolish most of the millions of dollars of court costs, fees, and fines levied against juveniles in Washington. Every year, more than 10,000 youth who have made childhood mistakes will no longer be held back by debts they have no hope of paying. Youth will also benefit from the expansion of access to juvenile record sealing. The YEAR Act was sponsored by Senator Steve O’Ban (R-Pierce County) and Representative Ruth Kagi (D-Seattle), and passed with nearly unanimous support in both chambers. While most states treat juvenile records as confidential, Washington State does not. This means Washington youth are uniquely locked out of employment, housing, and post-secondary education. Prior to the Act, sealing of juvenile records could only take place if juveniles had paid all fines and fees, at 12% interest, but youth often had no way to do so. Now, in addition to removing most fees, victims will be paid first, interest will not be collected, and courts may seal the records of juveniles who have paid individual victims. Five students from the University of Washington Child and Youth Advocacy Clinic, working in collaboration with Columbia Legal Services, led the charge for the bill.